Mobile World Congress 2018 – before the mayhem. 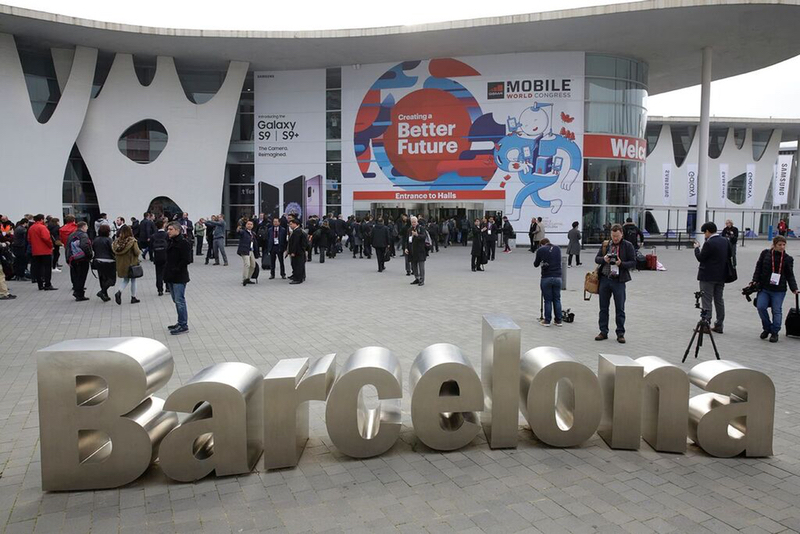 For every influencer, company and executive in tech and data, the annual Mobile World Congress in Barcelona is an unmissable event; so it goes without saying that our team attended the 2018 edition just a few days ago. With more than 100,000 visitors filtering into eight giant halls, the exhibition offers a real flavour of the trends that will define the following 12 months and beyond. But it was the quality of the audience, rather than the size, that was particularly noticeable. From telco operators to car-makers, the range of technologies on display offered plenty of food for thought, as did the increasing influence and understanding of the role of software as well as hardware in innovative future projects. Given the size of the show, if you are trying to cover everything in the halls it can feel like you are barely scratching the surface. But the congress is not just about walking the halls – it is also about networking away from the event, often late at night. The proliferation of so-called ‘assets on the move’, such as the mobile devices, vehicles and equipment on show in Barcelona, will lead to inevitable challenges in terms of data gathering and indexing. Companies need scale at speed in relation to assets on the move. There is going to be a lot more about mobility as a service and data that has location and time associated with it. For a high-profile and conspicuous example of what is to come, the Tokyo Olympic Games in just a couple of years’ time will showcase these kinds of technologies like never before to a mainstream audience. Autonomous taxis picking up delegates and visitors from the airport and taking them to their hotels and sports venues? It might be closer than the wider world expects. Traditional mobile telcos are presenting themselves as ‘Communications Service Providers” (CSPs) and it was very evident that their interest has been sparked by new services and applications that will be running on their networks from the rise of big data services. Most CSPs have an Internet of Things (IoT), Smart City or Smart Infrastructure story. These CSPs are well positioned to be the smart infrastructure companies powering the next generation of connected networks. Whilst eye-catching technologies such as autonomous cars always grab delegates’ attention, this year the show also highlighted how underlying data can drive innovation. The arrival of 5G and super-high capacity wireless broadband was a very strong theme at the Congress. Many CSPs are either conducting trials of 5G technology or getting ready for 5G and preparing business cases. It should be remembered that 5G is a shift away from how 3G and 4G networks were built in the past and the CSPs clearly want to evolve from just being the carrier of data services. 5G means operators will plan more services in the edge of their network – for example, from the ‘cell tower’ – and there is a large peer-to-peer local component to traffic management. This links to the way smart cities will be designed and it certainly links to the expectations that IoT networks ultimately drives lots of machine-to-machine (m2m) communications – it’s a very dynamic challenge for these CSPs. So 5G, and how it can power IoT, was a constant theme; especially its relevance for technologies in a variety of everyday sectors. Whether it is an autonomous car or a smart city, an IoT initiative will involve managing billions of data inputs per day. Big data management is a concern for many CSPs and they are open to finding solutions to help them manage, understanding and extract value from what runs in and across their networks. 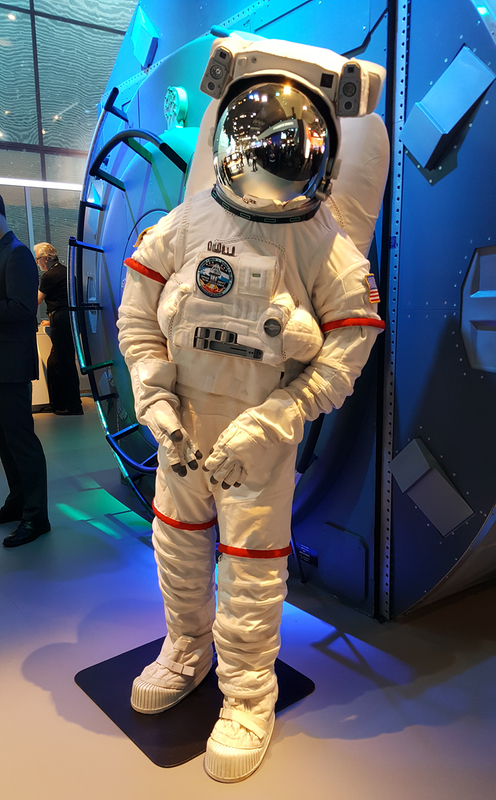 There seemed to be a subtle shift in the tone of the congress this year, with delegates and visitors more interested about the software and the value of the data that is being generated, rather than purely the hardware innovations. With that in mind, an explosion in extreme data management needs is widely anticipated. It is clear we are going to witness projects in need of handling volumes of data never seen before if we want to achieve the objective of safe autonomous cars or real smart cities. At the congress, we saw the general theme of big data, machine learning and AI throughout the Congress. In many cases, there are links to developing systems and services that require large data analysis and the teaching of machines to take over repetitive or a computationally difficult task. Virtual and Augmented Reality also had a strong showing at many stands, from next-generation games with the likes of Samsung and HTC Vive to smart-city modelling. Ad tech companies were present, but apart from positioning their matching engines for brands and publishers to meet, we didn’t see any differentiated services. As we evolve towards smart cities and smart everything, fraud and security of personal data in general and the relationships across different physical services and virtual services becomes much more critical. Location-sensitive security services were talking points for a couple of security vendors, as was addressing ad fraud. This is a theme that could become bigger over time. On various stands, including AT&T’s, there were vivid demonstrations of early-stage projects showing how data can be connected within cities and other infrastructures, making things much more tangible. Above all, it is about the connectivity between the hardware, such as how businesses are going to connect with each other in a smart city environment. 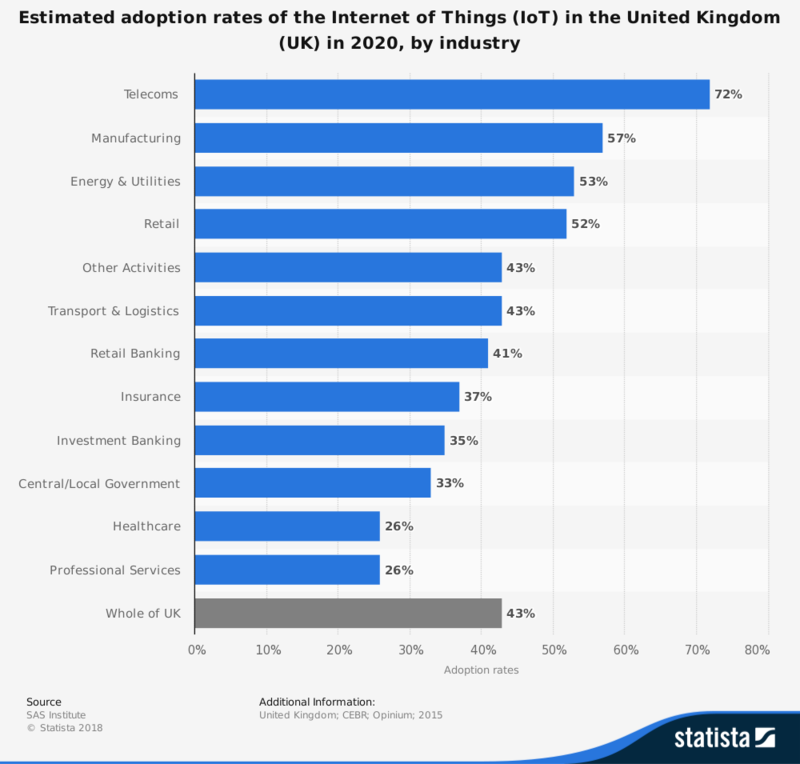 Estimated adoption rates of IoT in the UK by 2020 by industry. The rate of adoption is greater than expected. We were impressed to see American CSPs with IoT and smart city implementations already. AT&T is powering the ‘first-responder network’ on behalf of the US Government under a 25-year contract to build a dedicated smart network for emergency services. This network is already helping big cities like Atlanta to plan resources and services more effectively. For example, with dustbin collections, IoT sensors in trash cans can tell the trucks which ones are full and empty, thus optimising collection routes, reducing emissions and increasing operational efficiency. The congress amplified a sense that more people are seeing the tangible benefits of this connectivity as the story is told in more of a customer-centric rather than theoretical manner. Bringing these things to life helps to illustrate things more clearly. After all, our technology makes it possible to complete IoT, smart cities and autonomous car projects that otherwise would only be possible in the next 10 to 20 years. GeoSpock offers the data indexing and management capabilities to handle the inevitable transition from big to ‘extreme’ data that is being undertaken by ambitious smart cities. For more information about how GeoSpock can help smart cities to fulfil their potential, click here.